Just as scores of administrators, faculty and staff had signed on a few years before them with only dreams and visions of future to use as blueprints, the two men who were hired in 2001 to lead Florida Gulf Coast University’s then non-existent baseball and softball teams had taken similar paths to join founding Athletics Director Carl McAloose’ s new staff. For starters, both are named Dave. David Deiros is surrounded by his Eagle softball team after collecting his 400th career victory. Both had enjoyed consistent success as Southwest Florida high school coaches, Dave Tollett for 10 years and 175 wins at Punta Gorda’s Charlotte High School in Charlotte County to FGCU’s north; David Deiros for six seasons and 116 wins at Lely and Gulf Coast high schools in Collier County to the university’s south. Both make their livings coaching young men and women in sports built around diamonds. And the actual diamonds themselves that both helped build on the northeast side of campus with the support of staff, students and especially generous donors – Swanson Stadium for baseball and the FGCU Softball Complex, along with their adjacent training facilities – truly sparkle in comparison to facilities of other universities not only in the state, but nationally. Both were aboard for FGCU’s rapid athletics-program ascension and transition from NAIA to NCAA Division II to Division I. Both created programs that have lured players talented enough to win almost 1,200 games in 16 seasons, multiple ASUN regular-season and tournament championships, national rankings and a handful of NCAA Tournament games –including a 2012 softball upset over the University of Florida that was FGCU’s first NCAA Division I postseason triumph in any sport. Both have earned multiple Coach of the Year honors at various levels, and mentored so many student-athletes who have earned national, regional and conference all-star accolades – both on the field and, most impressively, in the classroom – that you’ll have to go to fgcu.edu/athletics with plenty of time to spare to look them all up. And while the women who play softball have limited options for pursuing professional playing careers after college, that certainly isn’t the case with baseball players. 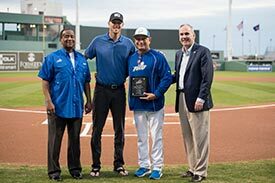 Dave Tollett is honored for his 500th win as FGCU head baseball coach with former FGCU President Wilson Bradshaw, Boston Red Sox ace and former FGCU pitcher Chris Sale and FGCU Athletics Director Ken Kavanagh. Dave Tollett celebrates his 500th win. 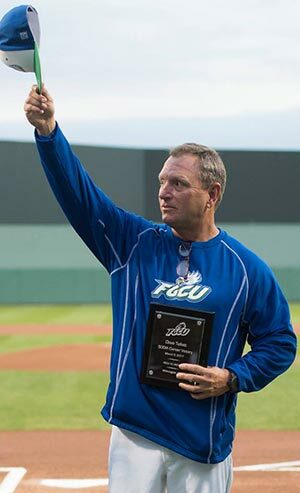 Tollett has coached more than 40 young men at FGCU who have been drafted by Major League Baseball organizations and/or signed by independent or international teams, with one, Boston Red Sox pitching ace Chris Sale, a perennial All-Star and potential Hall of Fame candidate. But the stars don’t tell the whole story. Both Daves also produce graduates who come from a service-learning culture in their programs that often blossoms into commitment to lifelong volunteerism, and a dedication to teamwork and attention to detail that transcend sports to lay the foundation for career and life success. In short, FGCU’s Daves of the diamonds have been major growth catalysts in the university’s 22-year history, with only founding women’s basketball coach Karl Smesko in their rarified class as coaches who have been Eagles since Day One (women’s soccer coach Jim Blankenship also is a program-founding coach, but his team didn’t start play until 2007). There is no better way to celebrate an ASUN championship on a hot Florida afternoon than an ice bath for winning coach David Deiros. As they coach in their 17th spring of everything cobalt blue and emerald green, we asked the two guys named Dave to describe what it’s like to create diamonds out of dreams. Florida Gulf Coast University head baseball coach Dave Tollett and head softball coach David Deiros are program-founding coaches still leading their respective programs in their 17th seasons. Along with current women’s basketball coach Karl Smesko and, interestingly, a third Dave in former men’s basketball coach Dave Balza (who just finished his sixth season at Palm Beach Atlantic University), Tollett and Deiros were the heart of founding Athletics Director Carl McAloose’s first coaching staff in 2001. We asked them to reflect on what it was like to build a university sports program from scratch and how FGCU has grown and evolved since their programs’ inception. QUESTION: When you first learned that FGCU was starting an athletics program and that baseball and softball would be among the first sports to field teams, how did you react to that news? How did you convince FGCU that you were the right head coach for the pioneering job? DEIROS: I moved to Southwest Florida to work as an analytical chemist and quickly learned that I did not want to leave. 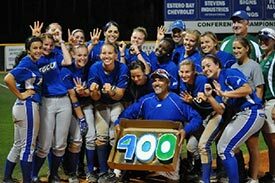 I had been teaching and coaching for several years when I learned that FGCU was going to start a softball program from an article in the Naples Daily News. I emailed Carl McAloose shortly after the article came out to inquire on the position and the hiring process, and really did not have much contact with him until the interview with Carl, Susan Evans, Butch Perchan and Hudson Rogers. I can’t answer for them as to why they picked me, but I’d like to think I convinced them that I would work hard, adapt to the environment and circumstances, and could win right away without sacrificing our educational ideals. Truthfully, I also think they liked the idea that I had a lot of local ties so that I could recruit our area and around the state, and that I had another job, because they did not pay me very much the first year, which was our recruiting year with no competition in 2001-2002. Dave Tollett and I worked our day jobs as educators in Charlotte and Collier county, respectively, and then would drive to FGCU to make recruiting calls from our offices in the trailers every night. It was hard work, long hours, but some of the best and most memorable times of our careers. TOLLETT: I was excited to hear that FGCU was starting a baseball program, so I contacted Carl McAloose about the job and the hiring timeline. I had a lot of ties in the state of Florida, having coached high school baseball. I was the Florida Athletic Coaches Association president for our area, so I had great relationships with all the area high school coaches, and as a member of FACA for 10 years, I had developed a lot of connections in the state. While I was coaching at Charlotte High School, we had a very successful program. We had three players who made it to the major leagues and several other draft picks along with 30 players who went on to play at the college level, so I had several references from pro baseball teams and college baseball coaches at the University of Florida, Florida State and Miami. QUESTION: Once you got the job, what were the first things you did? How do you start a collegiate athletics program from scratch when you have no roadmap — no assistants, no student-athletes, no facilities, no equipment? DEIROS: It really is all about the student-athletes. If you get the right ones, the ones willing to do more with less, the ones who bleed Green and Blue, the rest will take care of itself. It was all about introducing ourselves to as many high school and travel ball coaches and players as soon as possible so they knew there was another option for a quality, affordable education. Coach Tollett and I were on the phone just about every night in the fall and spring of 2001-2002, and I know I drove to just about every travel tournament in the state on the weekends — Tampa, Clearwater, Orlando, Plantation, Melbourne, Jacksonville. Don’t forget — we had no scholarships to offer, either. We definitely had no athletic scholarships, and we were still in our infancy as a university with still very few academic scholarships available — even for the most deserving students. We were trying to convince the best players we could find that they needed to subsidize their own education to come play for us. Job One was to try to introduce recruits in the state of Florida to FGCU and what was possible for them if they came. The issue was further clouded because we were not yet affiliated with a conference, let alone a division. Needless to say, not very many people knew who or where we were — mistaking us for the junior college in the Panhandle, thinking we were farther north, or even thinking we were in Mississippi, Louisiana or Texas. Seriously, I thought the “Florida” would give it away. In 2019, I know if we get the recruits on campus for a visit, we have a great chance to get them because of our fantastic facilities — competition and practice, academic support building, medical facilities. 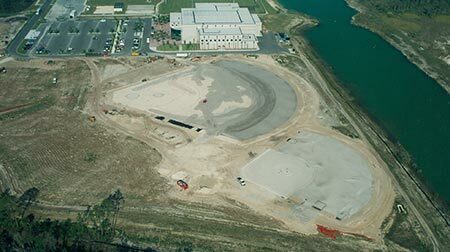 That wasn’t the case in 2001-2002, when we only had melaleuca trees where our athletic facilities stand now, and we weren’t going to build until after the first year of competition. We really relied on the vision of the people of FGCU — administration, faculty and staff — to help close the deal on recruits. TOLLETT: The first thing I did when I got the job was start recruiting, and it made for long days and nights. We only had $2,000 for expenses to recruit with. I would pack my lunch and dinner and get on the road, and I spent several nights at rest stops because we didn’t have money for hotels. I think I stayed in my car 32 nights the first year. I remember what Carl McAloose told us like it was yesterday, and it was the truest statement. It is what I built this program on. He said, ‘You only get to do this this one time, and what you do will set the foundation for years to come.’ Carl said we have to bring in great students — remember, we had no scholarships for the first three years — and we have to show our faculty that we are about students first. This is the way Carl wanted the program built, and I think we did it the right way then, and still do today. Academics always come first. Carl instilled in us a willingness to trust and respect our faculty. We continue to have a team GPA over 3.00, and last year we graduated all six seniors on time. It’s still true today: Always recruit a good student first, athlete second. QUESTION: As both of you are integral parts of FGCU’s history not only in athletics, but as an academic institution, what are the biggest changes you’ve seen through the years, and how have they impacted the way you recruit, coach and fundraise? DEIROS: Without question, for me it is how much Southwest Florida has adopted us as “their” hometown university, even though the majority of our friends and donors attended or are from elsewhere. When we first started, people would ask me what “FGCU” meant when I wore my coaching attire around town. Now, we are a much-appreciated brand in our area. I went to visit my son recently at college in Troy, N.Y., and even got a few “Wings Ups” while up there. We are a state university and therefore restricted by law on using state funds for athletics, but we have grown by leaps and bounds in students, facilities, scholarships — all facets of FGCU, not just athletics, because of the generosity and selflessness of our community. Ken Kavanagh likes to say that our Athletics programs are the front door of the university, and I’d like to think that our softball program, in addition to our other 14 sports, have been fantastic “greeters.” However, we would not be able to keep our friends, and we have had lifelong ones since 2001, without our academic and social programs providing the substance and fulfilling our mission of being “value added” to Southwest Florida. TOLLETT: Growth has helped us, and we now have so many more majors to offer our recruits. The area has grown with us, which is so amazing. I think a lot of our overall success is due to the fact we have had only two leaders in athletics, and both have been great at the job. Different styles, but the same bottom line. My career has been blessed by both Ken Kavanagh and Carl McAloose. I wouldn’t be where I am today — FGCU wouldn’t be where we are today — without these two leaders. They both do it the right way — kids first. The fundraising part, it was hard. We had no alumni, we had no team, we had no tradition. Two people who helped build FGCU baseball are Stanley “Butch” Perchan and Duane Swanson. Butch was so instrumental in fundraising for our program. He is the solid foundation of FGCU Athletics. Duane Swanson and the Swanson family have donated millions. We would not be where we are today if it weren’t for these people. QUESTION: How do you go about selling FGCU and your program to a recruit and her or his family? DEIROS: As I said earlier, come to campus and tell me you don’t want to come here. We have great facilities on which to play and practice. Our program has more than 600 wins, so we will be successful against a very challenging conference and non-conference schedule. We have top-notch housing, a beach on-campus, and several other beaches a short drive away. Most people get their first job in the area where they go to college, and who would not want to live and raise a family here? Most importantly, we don’t offer every major, but we do a great job educating our students in the ones we do offer. Just about everyone will have an interning opportunity to really get them ready for their chosen profession. I know the families really appreciate that, if their children come to FGCU, they will be very competitive in their chosen sport while taking advantage of their opportunities to thrive academically and professionally. TOLLETT: The sell is so much easier now than back in the earlier years. Now, we have tradition and history. Our sell to a parent is pretty easy. I can look them in the eye and tell them that I can promise that their son will graduate and have a chance to develop as a player and a person. He will have the opportunity to be seen by all Major League Baseball clubs, and we have history on our side — 45 players selected or signed as free agents, and four have reached the big leagues. We have had the National Player of the Year (Chris Sale) and the National Freshman of the Year (Jake Noll) along with four All-Americans, but also, we talk about our alumni from the academic side, depending on the major. We have produced doctors, engineers, MBAs, sports agents and others. QUESTION: If you had to start your programs all over again, what, if anything, would you do differently? DEIROS: Without question, document better — film more, take and save more pictures, clip and save more articles, things like that. I did not do a very good job of that, and did not realize how special an opportunity we really had blossoming in front of us. Not very many people get to do what Carl, Toe, Karl Smesko, Dave Balza and I did back in 2001. We built a program from scratch and went from NAIA to NCAA Division II to NCAA Division I in five years, all while having truly great teams be banned from post-season play because of NAIA and NCAA transitioning rules. My softball teams alone lost six seasons of possible postseason play in which they averaged 40 wins each year. No one has ever done that, and we did it with great student-athletes: Ashley Cecil, Christine Beck, Blaire Toleman, Boomer Ijjas, and the list goes on of the people who took a chance on us and built the foundation for where we are now. That first class took a huge chance on us, and I know they are proud they are Eagles. I only wish we had as good a record of their time here as we have for our current teams. TOLLETT: We had no road map to go on. We had to create our own trails. I think I would do it the same way — build the program on education and students first. We were moving so fast, I wish I would have taken more time to document better, but again, we were moving so quick that kind of got lost in the process. 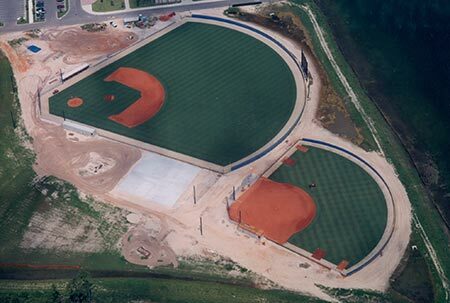 FGCU built its baseball and softball fields and training complex on the northeast side of campus. The facilities are regarded as among the finest in all of college sports.